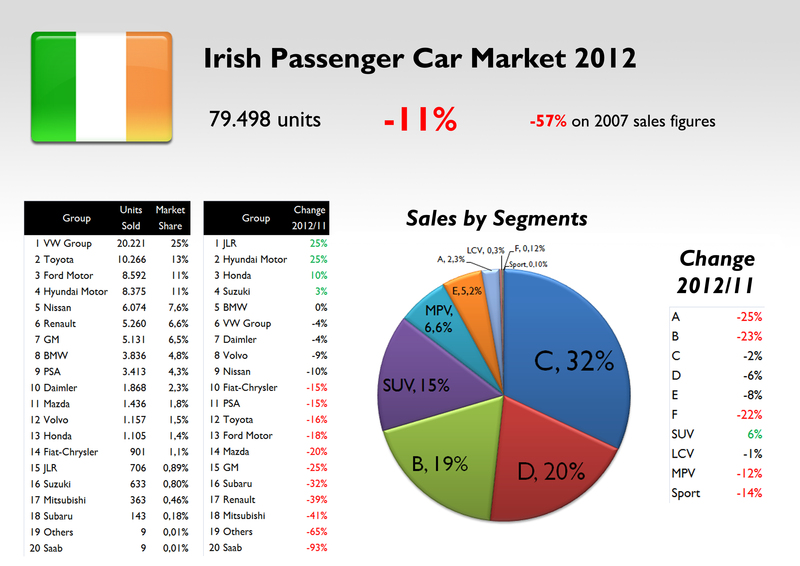 Irish car market fell 11% in 2012 to 79.500 units. Therefore it is ahead of Slovakia (69k units) and behind Portugal (95k). It means that 17 new cars were sold for every 1000 inhabitants. Slovakia is behind with 13 new cars/1000 inhabitants, and Portugal with 9. This market is far away from the good years when around 200.000 units were sold. Ireland, as Greece and Portugal, is one of the biggest losers of current European debt and unemployment crisis. The market is mainly composed by C, D and B-segment cars, just as it happens with the majority of European markets. SUVs come at fourth place with 15% share. MPV and city-cars aren’t popular. SUV was the only segment to increase its sales during 2012, up 6% thanks only to C-SUV and E-SUVs. A-Segment cars sales had the biggest fall. VW Group leads the market with the usual 25% share, doubling Toyota that comes at second place. The big event is Hyundai’s advance outselling Nissan, Renault and GM, and getting close to Ford. Fiat-Chrysler occupies 14th position, falling one position in favour of Honda. 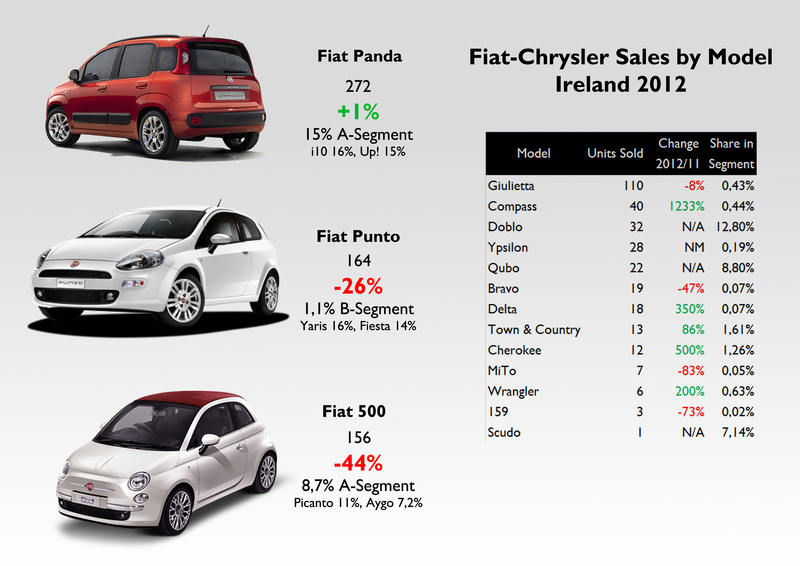 The group sales declined 15% mainly because of Fiat brand and its 500 and Punto. Good results come from Jeep which sold 58 units from 10 units in 2011. Chrysler had also a good start with 59 units. The big fall on MiTo’s registrations (-83%) took the brand to negative numbers, as the Giulietta had a tiny fall from 119 units in 2011 to 110 in 2012. Chrysler / Lancia is having a terrible 2013 though. 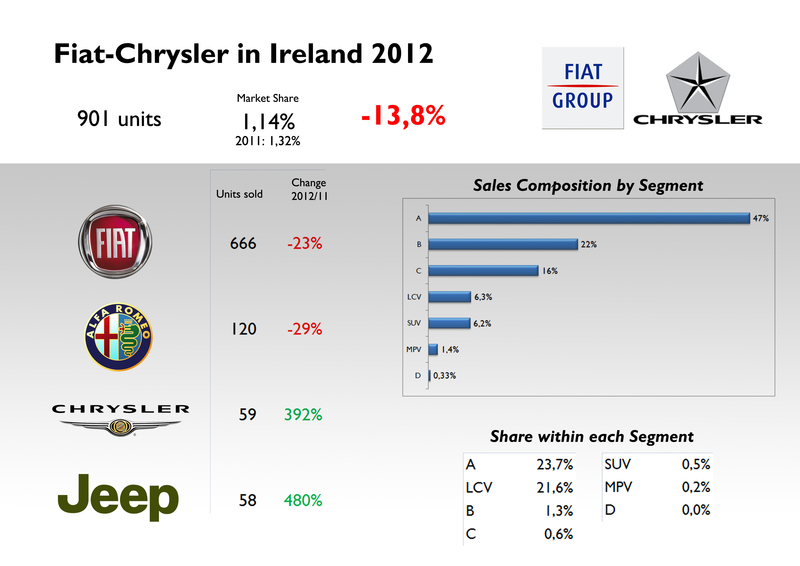 On beepbeep.ie they include Jeep sales with the Chrylser figures but it seems actual Chrysler sales are minuscule this year. I think 3 cars of which no Delta were sold. Not sure Lancia branding would have helped? Fiat is really picking up speed the last few months! Chrysler and Alfa are having a dreadful 2013. In October they sold just ! Chrysler and 2 Alfa Romeo, no Jeep. Fiat sold 19. I see a few 500L around, maybe it will help. As mentioned by AndyT, Lancia nameplate may not have helped, but personally I would prefer it!